Model TM33 Digital Tone Module provides audio input for any SelecTone® speaker/amplifier. The tone module holds a single pre-recorded voice message, tone or melody. 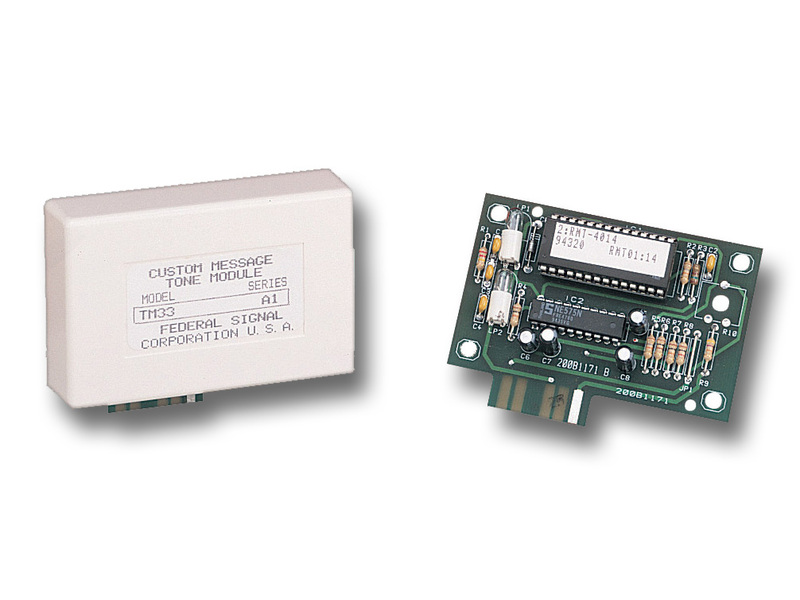 Each tone module contains the latest microprocessor based digital messaging system. This new PCBA module is capable of a 30 second playback of any custom tone or voice message. The tone or message can be reprogrammed at any time with the use of the 300FP field programmer, see page # for details. The model TM33 can either be set to play through once and stop or loop continuously. This solid state digital device will work with Federal Signal speaker/ amplifiers (including 50GC, 50GCB, 300GC, 300GCX, 302GC, 302GCX, 300X, 302X, 304GC, 314GC, 304GCX. 314GCX, 304X, and 314X) and the 300VSC-1, 300SCW-1, 300VSC-1044SB SelecTone Command Panels*. The TM33’s digital messaging capabilities are ideal for emergency evacuation announcements. Clear, concise, pre-determined instructions or custom tones can be broadcast. Manufacturing facilities often require an audible signal to indicate status (i.e. standby, shut down, operational, etc.). Simple pre-recorded melodies can indicate these situations, while voice messages can warn operators.